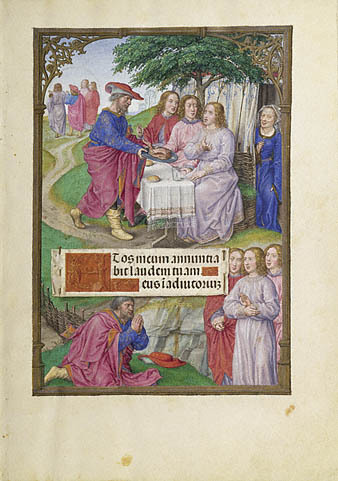 Abraham and the Three Angels ; Master of James IV of Scotland ; Flemish ; 1510-20; tempera colours, gold and ink on parchment; J. Paul Getty Museum, Los Angeles. Abraham and his wife Sarah have a visit from three unknown persons; Abraham goes to meet them and offers them traditional hospitality. Are the three visitors received by Abraham men or angels ? They are portrayed as men first, then as angels, recognizable by their wings. They are identical or have similar faces and clothes, for they are meant to represent for Christians the three divine persons, the Father, the Son and the Holy Ghost. Abraham shows no distinctive characteristic except his old age. His wife Sarah is often present in the scene of the meal but slightly apart. She listens and smiles when the guests announce that she will be a mother soon. But Sarah’s laughter can be given various representations. The scene takes place at the foot of a big oak at Mamre (or Mambre). The emphasis is put either on the meal served by Abraham to the three “men”, or on the meeting between the “angels” and Abraham who salutes them and bows low at their feet. Tobias is the hero of a real small novel with intersecting stories. 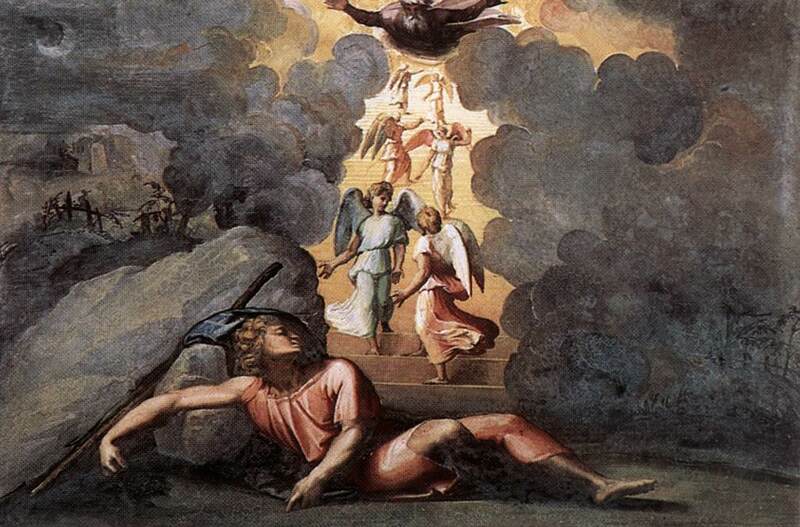 Tobias is the son of Tobit, a pious Jew who lives in Nineveh at the time of Exodus. The father sends the son to get a sum of money from a long-distance friend. He asks the young man to take a companion for this dangerous journey. Young Tobias meets Azariah, a youth who tells him that he knows the way and then they start on their journey together, but Azariah is none other than the archangel Raphael sent by God to protect Tobias, who is unaware of it. 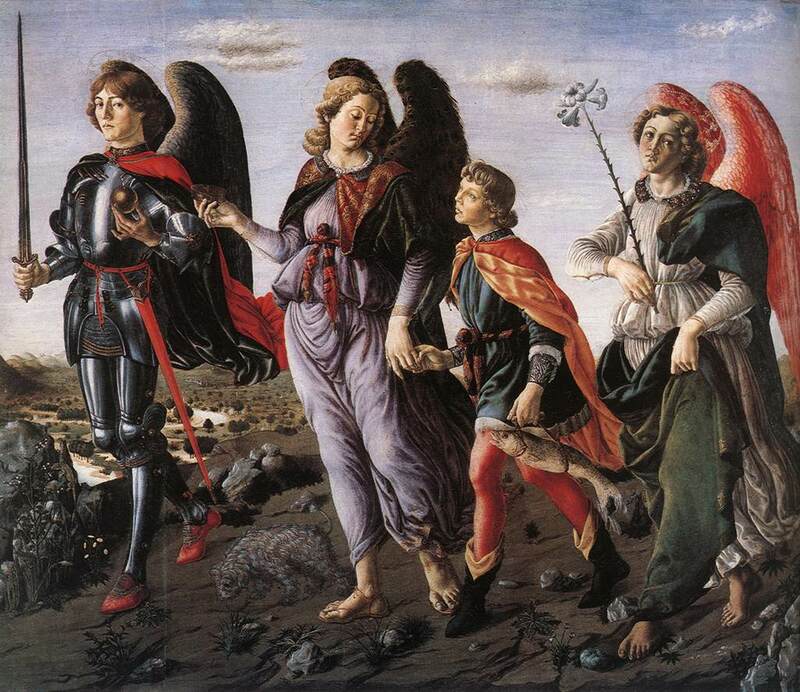 Tobias is often represented walking with Raphael, but sometimes they are accompanied by the other two archangels Gabriel and Michael. Nevertheless young Tobias and Abraham cannot be confused. Jacob’s Dream; RAPHAEL; 1518-19; fresco; Raphael’s Loggia, Vatican Palace. Jacob has a dream or a vision; he sees angels go up and down a ladder while God renews his promise that he will have a long descendance. No confusion is possible for Jacob asleep cannot be mistaken for Abraham adoring the angels ; in addition, Jacob’s angels are more numerous. God made a covenant with Abraham and promised him numerous offspring. But his wife Sarah, who was sterile, allowed him to have a son (called Ishmael) with Agar, her handmaid. A few years later, Abraham received a strange visit. And said, : My Lord, if now I have found favour in Your sight, pass not away, I pray You, from thy servant:"
Abraham offered hospitality to his visitors. While they ate, he remained standing near them. At the end of the meal, the angel said to him: "I will certainly return to you according to the time of life; and, behold, Sarah your wife shall have a son. Sarah, who heard that, "laughed within herself, saying, ...Shall I surely bear a child, since I am old? ...And the LORD said to Abraham, Wherefore did Sarah laugh ? Is any thing too hard for the LORD? At the time appointed I will return to you, according to the time of life, and Sarah shall have a son. Are these “three men”(the text constantly hesitates between the singular and the plural) God’s messengers, therefore angels, or are they God himself? They come and see Abraham whose hospitality is famous. The narrative is twofold with, on the one hand, the visit of the “three men” and, on the other hand, the announcement that Sarah, in spite of her great age, will be pregnant soon. The latter part is the more important since it is the fulfillment of the promise God made to Abraham: «And I will make thy seed as the dust of the earth: so that if a man can number the dust of the earth, then shall thy seed also be numbered.». 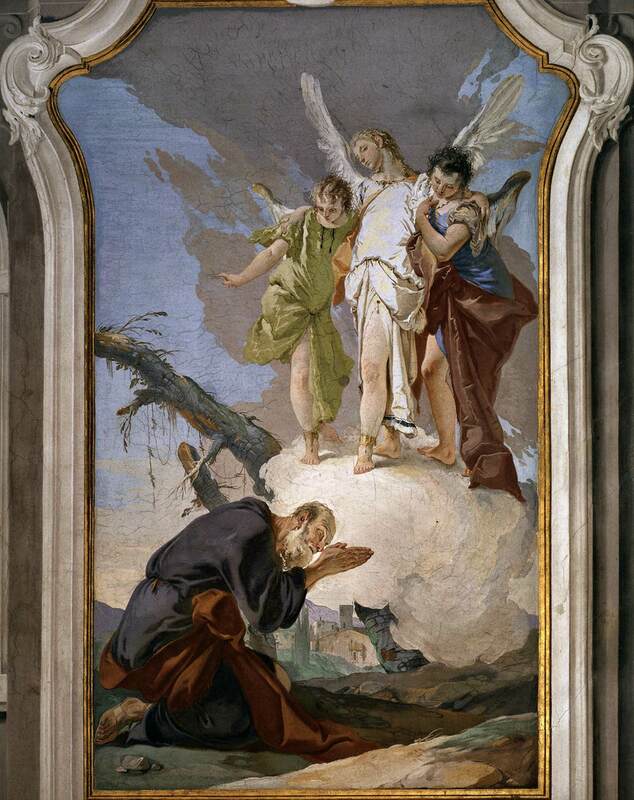 The Three Angels appearing to Abraham; Giovanni Battista TIEPOLO; 1728-29; fresco; Palazzo Patriarcale, Udino, Italy. Abraham and the Angels; Sebastiano RICCI; 1694; oil on canvas; the Hermitage Museum, St Petersburg. The scene of the meal is more or less intimate. Abraham and the Three Angels; REMBRANDT; 1630-1640; oil on canvas, the Hermitage Museum, St Petersburg. Abraham’s world is represented as that of the Turk or that of Classical Antiquity. Abraham and the Three Angels; Gérard de LAIRESSE, c. 1680, oil on canvas; Musée du Louvre, Paris. Since the end of the Middle-Ages, some painters have differentiated the three visitors, the one in the centre has become God the Father. What a difference between Gelder and Chagall ! Abraham and the Angels, Aert de GELDER; oil on canvas, Boymans van Beuningen Museum, Rotterdam. Abraham and the Three Angels; Marc CHAGALL; c. 1960, oil on canvas; Musée du Message Biblique, Nice, France. Sarah is more or less present in the scenes though the visitors have come to announce her future pregnancy. 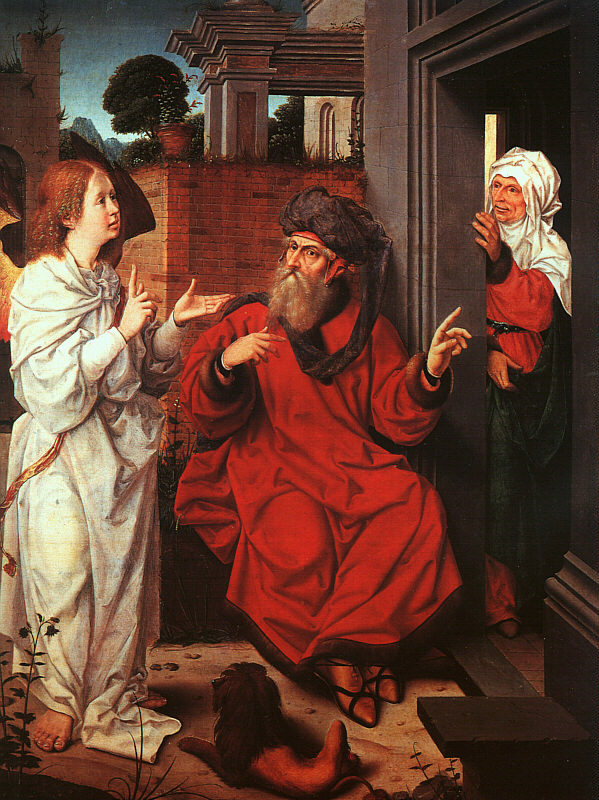 In Provost’s painting, the angel seems to speak to Sarah more than to Abraham. The composition takes the Annunciation to Mary for model, but here Sarah seems to doubt. Her “laughter” is a smile of happiness for Chagall. 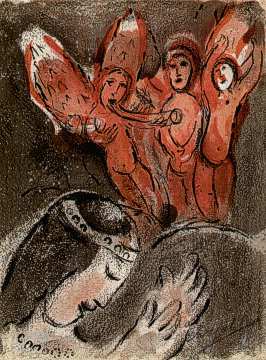 Sarah and the Angels; Marc CHAGALL; 1960 lithograph; Art Gallery, Chrudim. Can God be represented ? The Jewish tradition strictly forbids any representation of God but, very soon, Christians ignored it. Since God had incarnated Himself in Christ, he could be represented as a man. But once the interdict was lifted, the image of God “no man has seen at any time” (John 1:18) was no longer a taboo and very varied representations appeared. Souls rising towards the Trinity in Paradise; MAITRE FRANCOIS; miniature from St Augustine’s “City of God”; manuscript MMW 10 A 11, Koninklijke Bibliotheek, The Hague. A first, Christianity represented God by a hand coming out of the clouds or by an angel, then by Jesus with the features of a young man. But in medieval pictures of the Trinity, the three persons are sometimes not differentiated. The Trinity; miniature on vellum from a “Book of Hours” from the south of the Low Countries; manuscript MMW 10 E 3 , Koninklijke Bibliotheek, The Hague. or else they can be different: God the Father is imagined as a bearded old man and the Holy Ghost as a dove; only Christ keeps a proper human face. 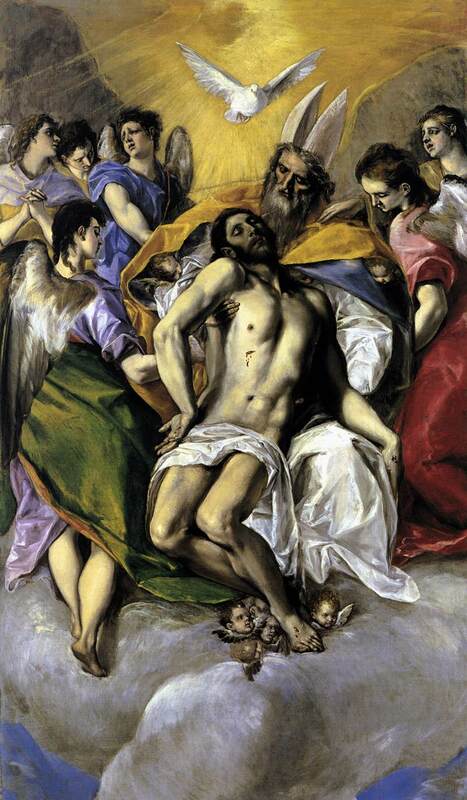 Certain artists then think it is enough to juxtapose the three representations to have an image of the Trinity. The Father and the Son are sitting with the dove between them. The Trinity, miniature from a missal from Lombardy; manuscript MMW 10 A 16, Koninklijke Bibliotheek, The Hague. Three-faced Trinity; miniature on vellum from a “Book of Hours of Delft”; manuscript KB 135 E 18, Koninklijke Bibliotheek, The Hague. The Old Testament Trinity, Andrei ROUBLEV; c. 1410; tempera on wood, the Tretyakov Gallery, Moscow. Nowadays, these representations seem rather shocking and this is the reason why that of Abraham’s three “men” has kept some favour, in particular in the Orthodox version as in the Trinity by Andrei Roublev, a 15th-century Russian painter.